A recent look at eLearning market trends by the Brandon Hall Group revealed a massive dissatisfaction with most Learning Management System platforms despite an obvious positive correlation between implementing a learning strategy and key performance indicators. A closer look at the data may help pinpoint the gap between satisfaction and success among learning technology customers. An astounding 48 percent of those polled revealed a desire to find a new or different learning technology. Nearly half of respondents (47%) are at least seeking to revise their current learning strategy. So why so much dissatisfaction? A look at top learning technology priorities may reveal the answer. Almost half (43%) of those polled are seeking better social and collaborative tools to implement within their learning management system. Other priorities include mobile delivery and better data handling capabilities. A healthy learning plan allows learners to collaborate with their peers and other experts in the field of study. You may not be able to teach an old dog new tricks but that old dog has plenty of things to teach a new, young pup. Effective learning tools allow the student to learn on the go or in the field with mobile technology. People are constantly on the go and they want their learning opportunities to match their pace. That thirty-minute morning train commute may be the perfect time to catch up on your company’s new product features, but only if your classroom can make the trip with you. The widespread dissatisfaction with learning technologies reveals many learning management systems simply can’t keep up with the desires and needs of the industry. Despite such discontent, Learning Management Systems account for more than a third of respondents’ (38%) learning technology budget. Nearly a third of respondents (31%) expect this amount to increase over the next 12-18 months. 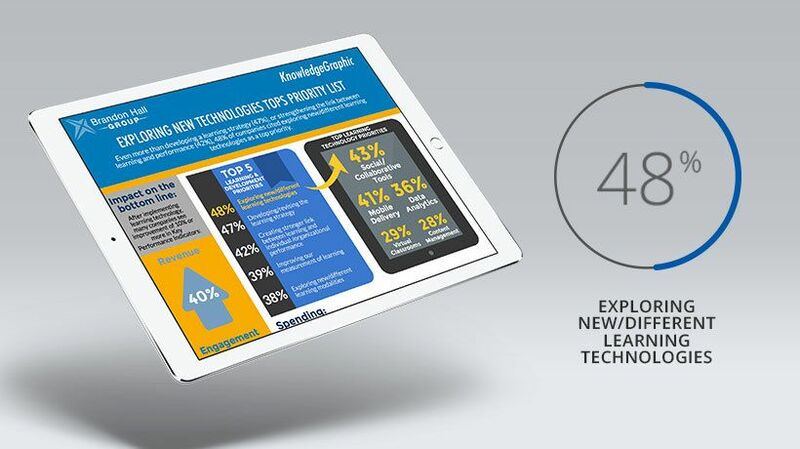 Only 3% of those surveyed expect to not invest in new learning technologies. So, considering how unhappy most companies seem to be with their online training platforms, why would companies increase this budget? A quick look at key performance indicators post learning technology implementation reveals the answer. Why would companies continue to invest in learning technologies? Simply put, it pays off. After implementing a solid learning technology strategy, companies saw significant increases in key performance indicators. Nearly half of respondents (40%) saw at least a 10% increase in profits after carrying out an effective learning strategy. Continuing the positive trend, 53% saw a increase of at least 10% in both productivity and engagement. Cost also dropped 10% or more for more than a quarter of respondents (26%). With such an obvious positive correlation between implementing a well balanced learning strategy and KPIs, it’s obvious why so many companies expect to increase their Learning Management System budget. That investment will pay off in dividends. A well trained staff doesn’t just perform better - they feel a greater level of satisfaction on the job. Companies with a well implemented eLearning strategy had a 16% decrease in turnovers. This drop in the turnover rate certainly played a role in the decreased costs mentioned above. An under trained employee is destined to underperform. Lackluster performance leads to dissatisfaction for both the employee and employer. If allowed to go unchecked the problem snowballs into the inevitable avalanche of resignation or termination. From there, the vicious cycle of underperformance repeats. Satisfaction data can again reveal industry-wide weaknesses and opportunities for improvement and there is much room for improvement according to the numbers. When asked how satisfied they were with how well their current Learning Management Systems handled various learning environments, only formal eLearning course management systems received a passing grade of 71%. The average grades for informal and experiential environments hovered at just above 50%. Considering these numbers it should come as no surprise that half of those polled (44%) expect to replace their current Learning Management System in 2016; a 6% increase over 2015. The advantages of a diverse, blended learning strategy are well known, but it seems many struggle with implementing such a strategy. All of the data above points to an obvious conclusion. Change is necessary and inevitable for anyone eyeing success. Onboarding can no longer be a series dry training videos, a handshake and an expectation of immediate triumph. Compliance and new skill training must not be viewed as a chore but an opportunity for growth guided by proven experts and peers alike. Yesterday’s inconvenience is tomorrow’s opportunity.